Does It Pay To Be Socially Responsible In Business? | Business Article | MBA Skool-Study.Learn.Share. Does It Pay To Be Socially Responsible In Business? Mr Vimal after completing his MBA, worked with his family owned retail business ‘Rama Stores & Sons’ since last 2 years. In one of the board meetings he proposed that the company, like most other competitive organizations should also indulge in CSR activities. 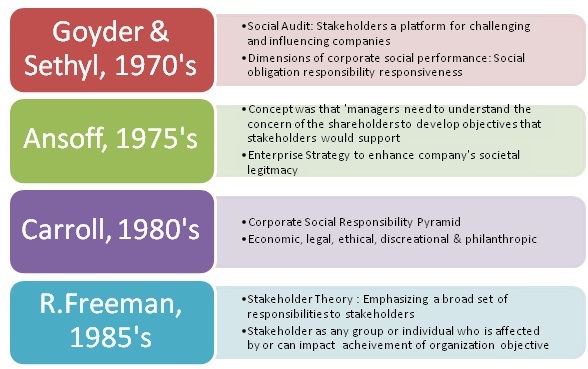 The term ‘socially responsible’ has been changing over time. Earlier an organization was termed to be socially responsible if it initiated charity trusts to contribute in the field of education, health etc. But now with changing trends and mindset of corporate as well as consumers there has been gradual change in its very connotation. Being socially responsible is now seen as an integral part of the business strategy of a company. At the same time anybody (company, government or a social enterprise) needs to be prudent enough while deciding upon its initiatives of social responsibility as it might lead to conflicting interests of stakeholders. 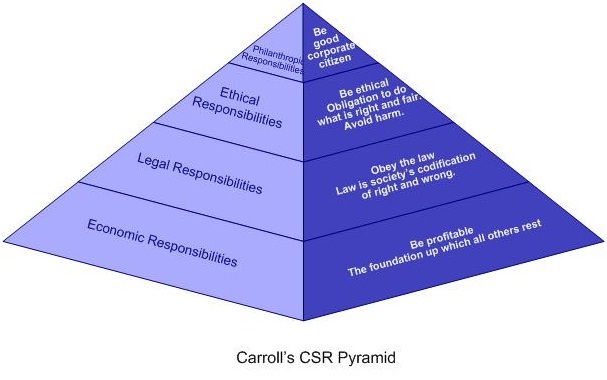 In 1991, Carroll presented his CSR model as a pyramid and suggested that, although the components are not mutually exclusive, it “helps the manager to see that the different types of obligations are in constant tension with one another”. In a country like India where about three quarters of India’s poor live in rural areas and a staggering 87% of India’s rural population lives in poverty. Rural markets have a demand of about 60% of FMCG products produced in India. But the rural markets are scarcely scattered so private companies usually find entering rural market less profitable. Thus there is need for making socially responsible distribution strategies by companies. In 2007 ITC diluted its equity in India to be classified as an Indian company rather than a multinational. Earlier farmers used to take their produce to “mandis” where each farmer was offered price on basis of crop’s moisture content, foreign matter and broken seed in the produce. Thus bargaining power of farmers was very less and they had no information regarding prevailing market price. Later ITC came up with concept of ‘e-Choupal’ with an IT based procurement system. The farmers could now give their produce to nearest local ITC procurement centre. It helped them cut down on transportation cost, reduce wastage and requirement of labour. It helped farmers obtain weather forecasts, farming practices and latest commodity price using satellite connectivity. This lead to cost reduction in the procurement system by about 5% due to direct procurement adopted. The profit was shared equally by both farmers and ITC. Later ITC also opened up branches of Apollo Hospital near the procurement centre. Thus it was a socially responsible distribution strategy adopted by ITC thought it had to face some initial problems like that of infrastructure, electricity supply, telecommunication connectivity and resistance from middlemen. But with time the degree of socially responsibility and profits being earned became a kind of cyclic process. There have been instances when a company takes huge risks to act as beneficiary for all stakeholders. Under such circumstances some earned long term benefits and a loyal consumer base while others have made huge losses and just disappeared. For instance in Chicago (1982) when Johnson & Johnson found that one lot of its drug ‘Tylenol’ is laced with cyanide and might cause death of people who consumed it. As per the standard procedure only contaminated lot had to be taken from market. But J&J recalled the entire production lot of Tylenol to minimize the risk of life of consumers. It suffered huge monetary losses on this action but management remained adamant about this decision. After about six months J&J re launched the drug and to the surprise of management they had won over a huge consumer base by their action. Finally J&J earned huge profits and reaped fruits of being socially responsible. 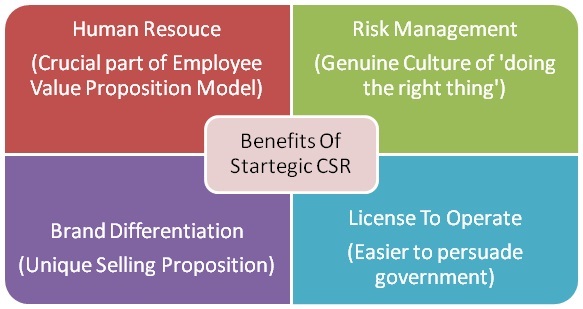 But at the same time with changing trends it is important that companies if wish to be socially responsible must align their socially responsible initiatives with their business strategy to reap its benefits. For instance if a company in the field of telecommunication plans to collaborate with an NGO and contribute in the field of education at primary level then this decision does not seem aligned to its business strategy. But on the other hand when ITC donates one rupee on purchase of each Classmate register for promoting primary education among the consumers then it seems aligned to its business strategy .It would reap benefit of being socially responsible as its register would be preferred by consumers over similar products as they can relate themselves with importance of education. The term ‘socially responsible’ is a very broad one and often companies tend to narrow it down to safeguard their interests on one hand and building good image on the other. For instance many organizations these days are involved in tax avoidance activities to minimize the taxes they have to actually pay. It is actually minimizing their contribution towards the society which is an integral part of any companies’ stakeholders. CSR is usually understood as philanthropy. But CSR is not only about fulfilling a duty to society. It should also bring sustainable competitive advantage to the organization. For e.g. If a hotel like Taj sets up a hospitality training institute in a rural area, it is not only helping the youth of the rural area find appropriate employment opportunities, it is also feeding its manpower requirements at the entry level. Thus CSR doesn’t have to be charity. It should be well thought out and planned so that it makes business sense. So the CSR model needs to follow a path of change which begins at a model which emulates a philanthropic approach, i.e. charity to the poor, hungry or disadvantaged beneficiaries. The next stage in the evolution process is the support model, which entails offering help and support to the communities which are directly impacted by the operations and business of the firm. The next stage, the core competency model, involves leveraging core competencies to impact large scale social issues. The last stop on this journey of change is the win-win model. It entails sustainable, win-win business and community inter-linkages. Government of developing countries’ is struggling to alleviate poverty. Thus even government takes up socially responsible initiatives by investing in domains and regions which the private enterprises feel as risky and has low return on investment. For instance the department of post helps in serving the poor by offering them valuable services at low cost. It provides the poor with services like insurance, mobile telephones and access to information about foreign universities .It uses part time franchisees who get allowances instead of permanent employees thus enhancing sustainability of its initiative. As an outcome it helps government channelize rural savings into the formal economy. These days there is huge scope in the domain of social enterprise who make business strategy to achieve goals that can create social impact. For instance the ‘Boond Foundation’ which produces hand made goods, solar lamps etc at reasonable cost. It then uses the margin earned to promote entrepreneurship in villages. It provides both monetary and non monetary support to youths in villages. But even these social enterprises need to generate profits to create self sustainability. As a result of socially responsible initiatives both by government and private companies the poor people living in rural area become better informed and also minimize their exploitation. Not only companies but consumers also need to be socially responsible. For instance people should prefer indulging in socially responsible investment as compared to conventional funds. For socially responsible investments the investment decisions take into account both financial and non financial considerations with emphasis on non financial considerations like ethical, environmental and moral concerns. Most studies have found that SRI (Socially responsible investments) are in fact risk adjusted in nature. So on a risk adjusted basis it is evident that there no difference in returns on SRI and conventional funds. Also investors might be attracted to invest in SRI funds because they find their personal values aligned to underlying philosophy of particular SRI. Hence SRI considers both the investor's financial needs and an investment’s impact on society. Indeed SRI investors also encourage corporations to improve their practices on environmental, social, and governance issues. Thus socially responsible initiatives could be started by government, companies as well as social enterprises. This concept has been shaping over time. But with time enterprises are trying to align their socially responsible initiatives to their business strategy with long term goals in mind, but the intentions behind them seem hidden. Also it is vital to note that whatever might be the intentions behind such initiatives, as part of strategy they must be communicated to at least all employees in the enterprise. 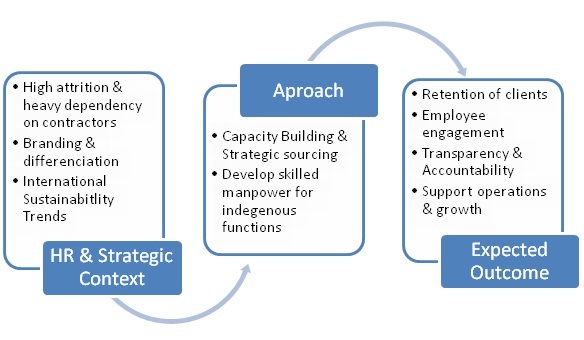 After analysing the findings of research (primary and secondary) and benchmarking done Miss Garima, proposed the above model that could be implemented in the company’s context. This article has been authored by Gunjan Kumar & Ruchi Batra from MDI Gurgaon.